Last weekend was the eleventh Puppets Up! International Puppet Festival in Almonte, Ontario. It was also the eleventh one that I attended. 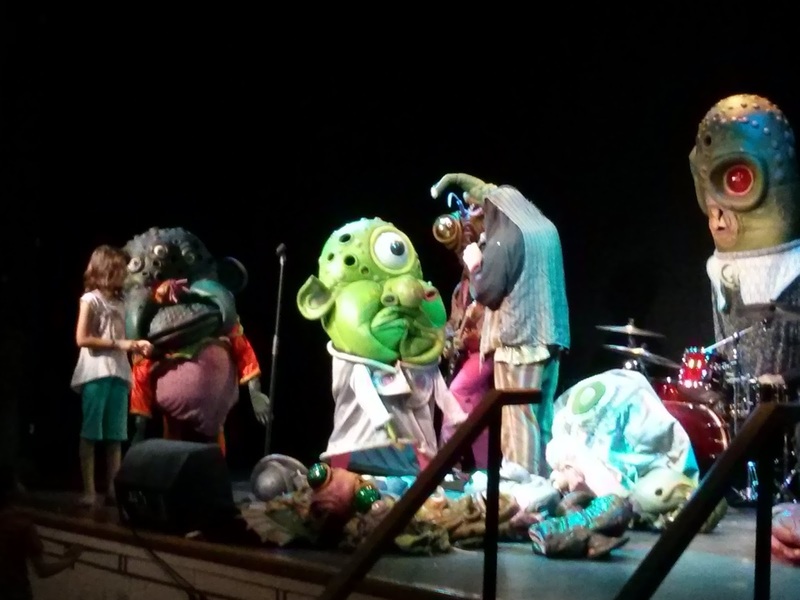 The highlight act of the festival for me was Big Nazo's Intergalactic Creature Band. The show was presented as a rock concert being put on by extraterrestrials in the hope of drawing more of their kind out of hiding. 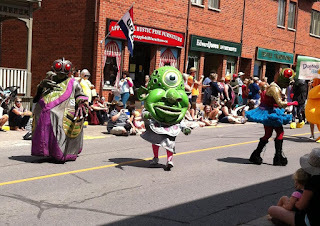 The aliens were all larger-than-life puppets and costumes with latex skin that looked like they stepped out of my fever dreams. Creatures came and went, and the lead singer went through multiple physical transformations, all while playing catchy rock music. Not pre-recorded, either -- they really were playing guitar, drums, and bass while wearing these ridiculous outfits. It was delightfully bizarre. 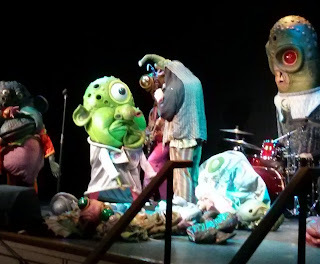 In the picture below you can see Cornea the Astro Troll (left) interacting with the lead singer (right, in one of his many incarnations). 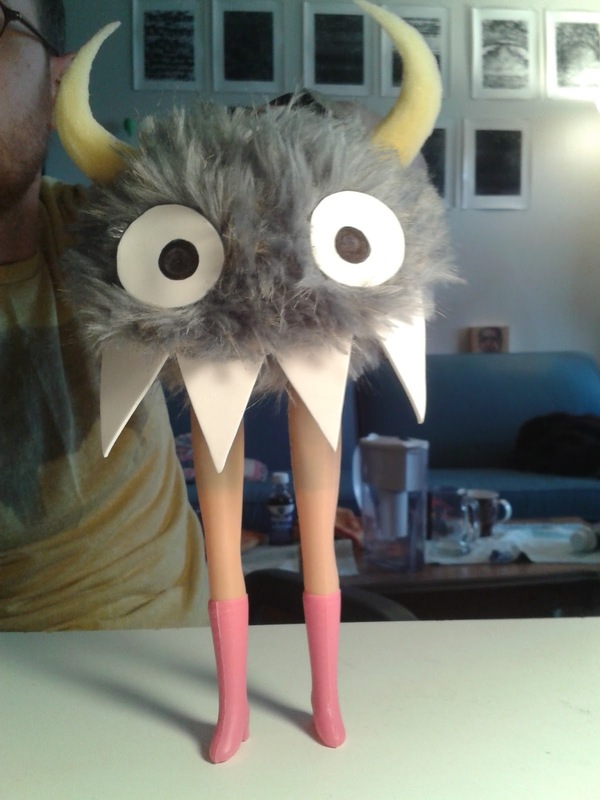 Cornea is a walkaround character whose head takes up most of her height. The performer inside can wiggle her arms and nose, open and close her mouth, and even stick their arm (clad in a red sock) out of her mouth to be her tongue! I also enjoyed Bernd Ogrodnik's Peter and the Wolf. We'd seen Bernd at Puppets Up! back in 2009, when he performed this amazing piece, among others. 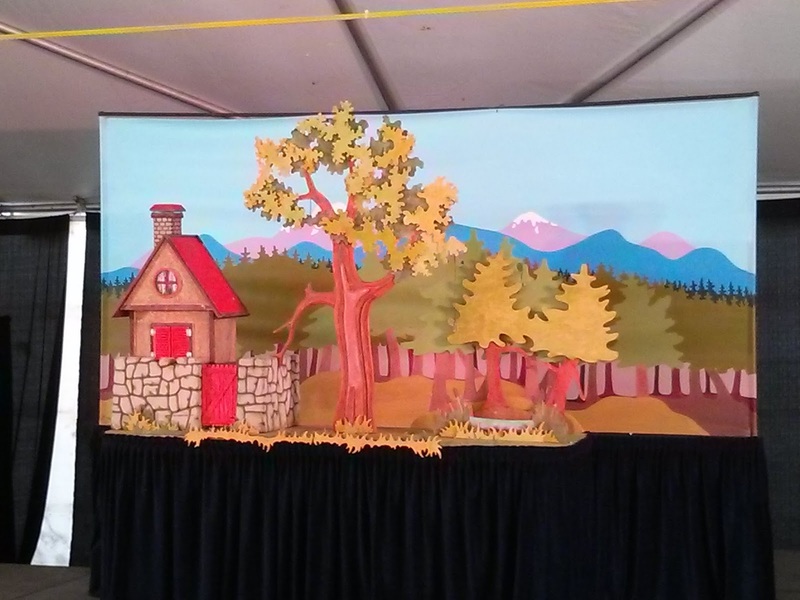 Peter and the Wolf featured beautiful tabletop puppets that borrowed elements from marionettes. Using a clever control on the back of the head, the puppeteer could work the head, arms, and legs of a character, all with one hand! We weren't allowed to take pictures during the show, but here's a picture of the set. It had magnets strategically positioned around it to hold characters in place when the puppeteer's hands were occupied elsewhere. Saturday night was the festival's adult-only cabaret. I did a tabletop puppetry act based around the song "Nice Legs Shame About Her Face" by The Monks, featuring Moss and my new character, Lexi. If you can't tell, Lexi was built specifically for this act. Her legs are from a Barbie doll knockoff, and my middle and index fingers go inside them, enabling her to walk around. I might do a post about her design and construction sometime later. 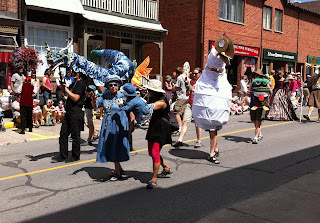 Atlatl made his work-in-progress debut in the parade on Sunday. He got a pretty good response from the crowd, and I was able to keep my arms up inside his head for the entire seventeen minutes that it took to walk the route. In the picture below, you can see the title character from Tanglewood Marionettes' The Dragon King on the left. Also on Sunday, our friends Nicole and Stef came to the festival with their four-year-old and ten-month-old. For all the times I'd been to the festival, I'd never gone with kids before. It was great fun -- we took them to Tanglewood's aforementioned Dragon King and Frogtown Mountain Puppeteers' The Headless Horseman of Sleepy Hollow. We'd seen both shows before, and both of them are great. We're also friends with both troupes, so they let us take the kids backstage afterwards. Cedar, the four-year-old, thought that was really cool; she'll probably insist upon it at every puppet show she goes to from now on. 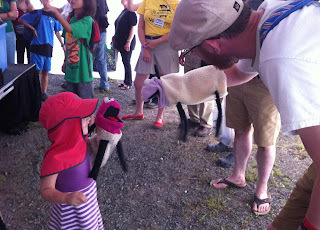 Here we are goofing around with Frogtown's sheep puppets. A terrific festival all around. See you in 2016!